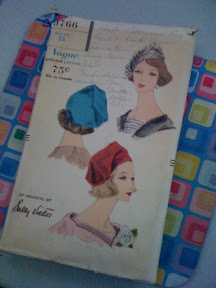 I found this fabulous vintage Vogue hat pattern while on a junk walk-about. I am hack seamstress at best but there are only four pattern pieces so maybe I can manage. I'll dig through my fabric stash and keep you posted.